I was really buzzing about my trip to Singapore. Despite having an absolute blast in the likes of Myanmar and Cambodia, I was really missing the big city vibe I had fallen in love with in Hong Kong so couldn’t wait to touch down. As it happened, my arrival in Singapore was about as high octane as it could have been. I’m quite a simple traveller – I’m not an adrenaline junkie, I don’t jump out of planes or even ride scooters (my last attempt ended with a hospital visit – kind of put me off). And yet, despite that, I seem to find myself in the most bizarre situations in the most bizarre places. Of course, it could only be me out of hundreds of people who got hit by a stray firework on an El Nido beach and, similarly, it could only be me who ended up embroiled in some James Bond-esque stunt at supposedly the best airport in the world. In fairness, it wasn’t Singapore’s fault (and my dramatic entrance would have been much less clean had I been anywhere else). Oblivious to impending doom, I hopped on one of the many travelators to get to the subway which would take me to the city. As I didn’t think I’d need to have my eyes on the ball when going on a walkway with all the speed of a dying snail, I was browsing on my phone. It was only when I heard the two French tourists ahead of me screaming that I realised something was up. From what I can gather, they had been too busy chinwagging that they hadn’t noticed that standing side by side with two big luggage trolleys wasn’t going to work when it came to the narrow exit of the travelator. Hence, the luggage trolleys got stuck but the walkway kept moving. The frantic cries of “EMERGENCY STOP!” didn’t seem to be doing anything (either nobody could find the button or the spectacle was just too entertaining to watch). Very nobly, the French tourists who caused the disaster had already clambered off, leaving a huge pile of their luggage and the trolleys blocking the way out – and I was next. Trying to walk backwards on a moving travelator is very hard, particularly when there’s a queue of people behind you with luggage and trolleys. With no wait out and no way back (that’s going to be the movie tagline, I’m in talks with Hollywood), I just had to try and clamber over the luggage as more luggage, trolleys and people behind me piled on top. It’s one of those adrenaline-fuelled moments where you’re not really thinking about what you’re doing, but your body just kicks in. I managed to clamber above all the luggage and flop off the travelator with all the grace of a sleepy hippo. Finally, someone hit the stop button and there was that eerie moment of silence when you could tell everyone wanted to shout and swear at the French tourists but knew it was neither the time or place. Despite a few cuts and scratches, neither me nor anyone else were badly hurt, but it was quite an ordeal. Proof that life can throw curveballs at any moment… and that French tourists need to pay attention to what they’re doing. Changi airport trying to kill me off didn’t deter me and I grabbed the subway to my hostel. The subway in Singapore is predictably expensive, though it’s not quite hit London prices yet. I paid around S$2.30 for the trip to my hostel, which is around £1.15. My hostel, Betel Box, was really good. For around £10 a night (one of the cheapest choices for Singapore), you get a large but quiet dorm, a good common area, toast for breakfast (with Marmite!) and they even have 10% discount on all the big tourist attractions. The location’s good too – a 15 minute walk from Paya Lebar subway station and right next to a gigantic night market with so much cheap food. As it was nearing the end of Ramadan whilst I was there, it was always packed and had a fantastic atmosphere. Singapore may be expensive but it’s easy to find decent, cheap meals. I was eager to go and photograph the Singapore skyline, with futuristic architecture such as the unfathomable Marina Bay Sands and the innovative Gardens by the Bay. You seriously don’t know where to look. 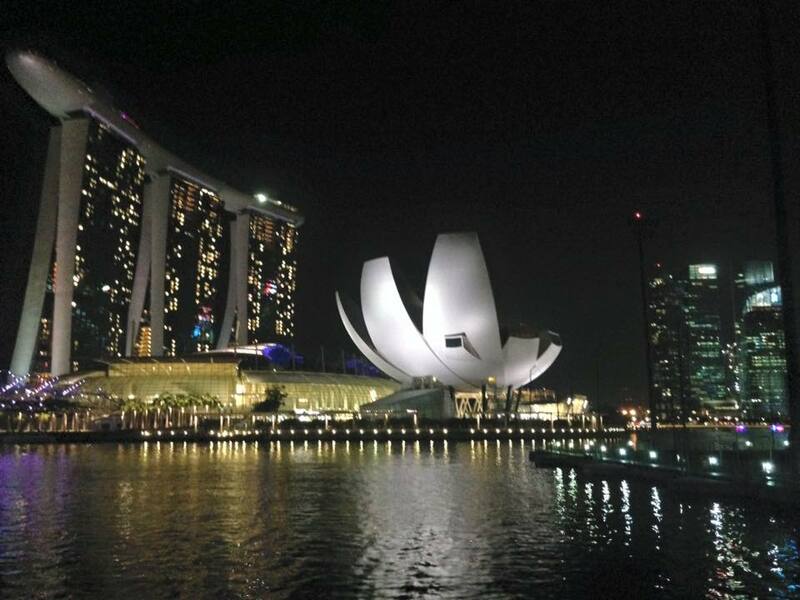 Take the subway to Bayfront and then stroll through the illuminated Gardens by the Bay before walking over the bridge to get a view of the bay, the skyscrapers and the hotel which looks like it’s been lifted directly out of Star Trek. It’s insane. The view doesn’t diminish in the slightest during daylight either. In fact, if anything, the Marina Bay Sands looks even more bonkers since you can see the building in detail and just baffle yourself at how it even exists. The Gardens by the Bay are worth a visit during the day too – it’s completely free to walk amongst the futuristic trees. You only have to pay if you want to do the walkway up top, but I thought the view was better from afar, rather than paying to get up close to something which was designed to be seen from a distance. 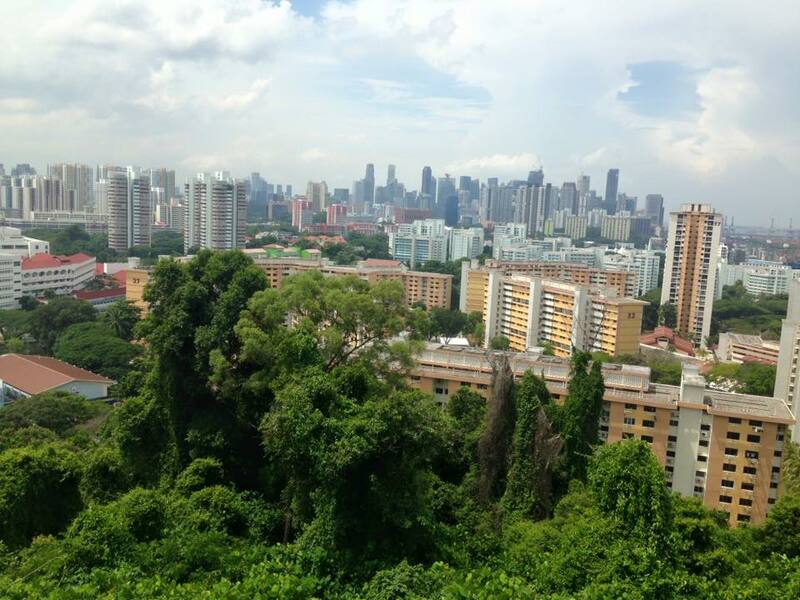 I think it’s why I could never get bored of Singapore. Like the awe-inspiring Hong Kong skyline, I can never envisage stuff like this not being a novelty to me. 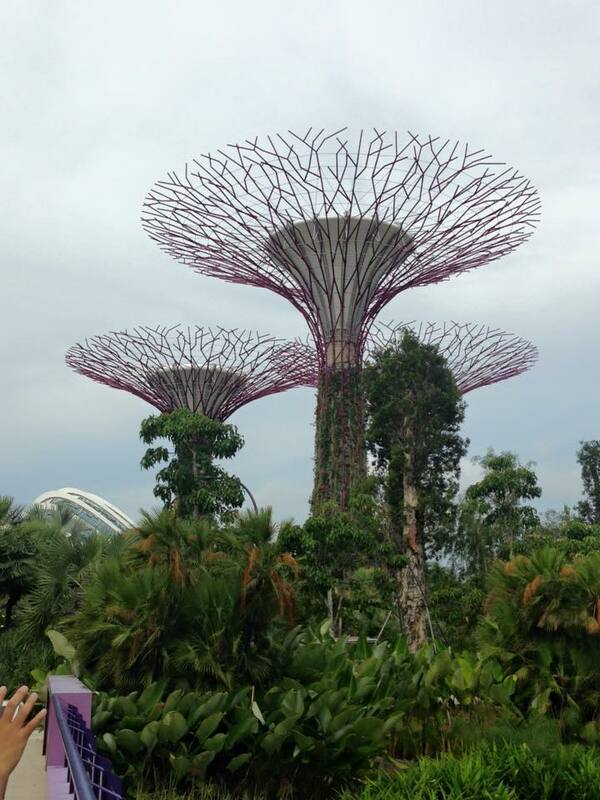 I could view the Gardens by the Bay again and again and again and still be amazed by the huge trees. 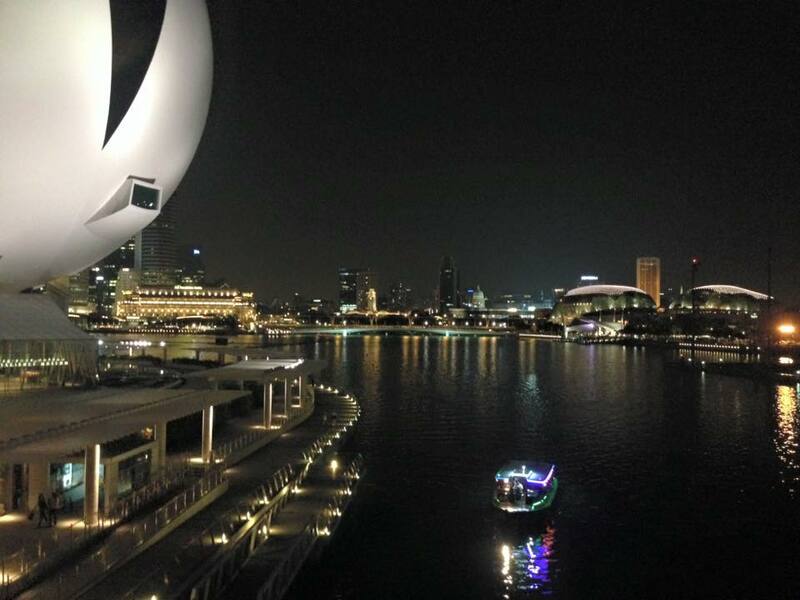 A lot of cities in the world have great skylines and city attractions, but none as innovative as Singapore. One thing that always warrants a big tick in my book is a big city with a lot of green spaces. One of my favourite things about Hong Kong was how easy it was to escape the city and be in lush green landscapes. Whilst I don’t think Singapore quite has the level of countryside Hong Kong does, there was still a great opportunity for a hike by taking the Southern Ridges walk. Unsurprisingly, it’s at the south of the island and guides you through big parks, canopy walks, gardens and great viewpoints. It’s a great twisty-turny mix. Luckily the weather was fantastic (though very hot!) so I got some great views and didn’t get rained on. I started off at Kent Ridges (the MRT station’s on the orange circle line) and finished at Bayfront MRT. I think you can start a bit earlier but between those two is where the bulk of the interesting stuff is. The signage varies depending on what part of the trail you’re in but there’s a basic guide here. The whole trail is 9km and it’s not particularly difficult except for the heat. Overall, I had a fantastic sightseeing day in the city. I kept finding myself trying to compare Singapore and Hong Kong but that’s doing them both a disservice really. They’re both incredible cities, with a brilliant mix of just about anywhere. I know I’ll go back to them frequently and wouldn’t object to calling either of them my home in the future.